You made a custom sprite for this game and you want to share it with the community? We have a subreddit! Check it out /r/PokemonInfiniteFusion! And a lot more. Got to the Changelog section for the full changelog! This is a game based on the pokemon.alexonsager.net Pokemon fusion generator. This game re-introduces the DNA Splicers from Black and White 2... Except this time, you can use it on EVERY Pokémon! Use them to combine any two Pokémon together into a completely new Pokémon, putting the total number of individual Pokemon available in the game to 22 801! Pokemon Fusion: Every Pokémon can be fused with any other Pokémon to create an entirely new species by using DNA Splicers! Full Gen 5 style graphics: Revisit the Kanto region in the style of the 5th generation! 22 801 Pokémon: All with unique sprites, movesets, stats and everything else that a regular Pokemon would have. The first thing to do after updating your game to 3.0 is to go to the top floor of a Pokémon Center and talk to the Update Man. Also, if you are updating from an earlier version, you might get stuck if you last saved in a map that no longer exists. These maps depend on which version you're updating from. To be safe, I suggest you save inside of a Pokémon Center before updating and you shouldn't run into any problems. Added Rock Tunnel, Lavender Town, Pokémon Tower, Celadon City, Celadon Sewers, Fuchsia City, and all the routes in between. 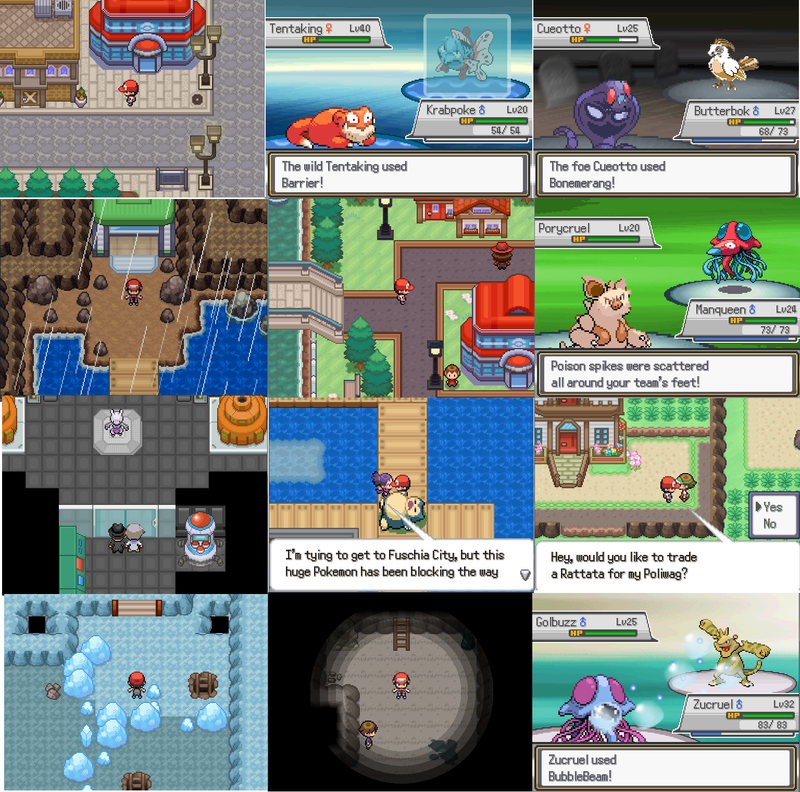 Revamped several older maps such as Pallet Town, Viridian City, Pewter City, Route 3 and Route 9. Added Trainer House: Battle facility where you fight teams of random Pokémon to earn points. And a lot more stuff for you to discover on your own! 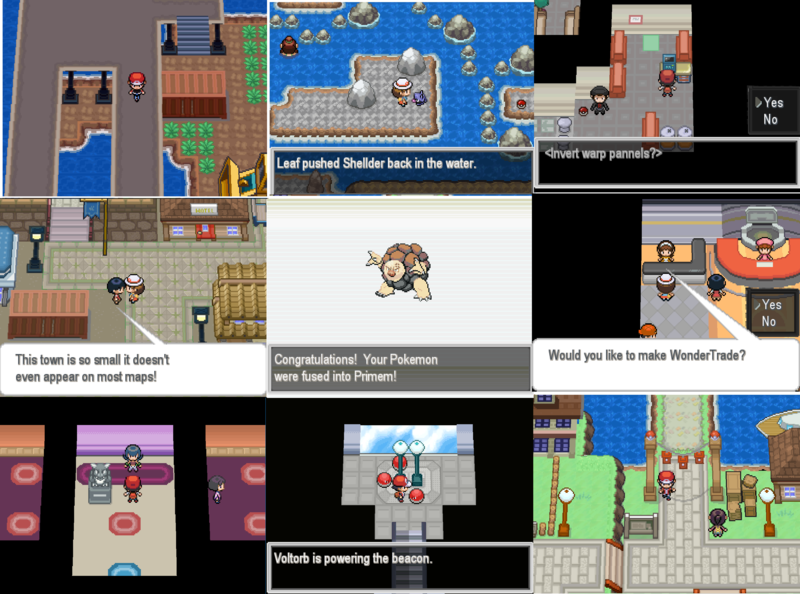 New maps for Viridian Forest, Viridian City, Pewter City, Route 1, Route 3, and Route 9. Added small surprise at the end of the demo! Player being sent to a Pokemart instead of home when blacking out before entering Viridian City's Pokemon Center. The demo ends after the 8th gym. Don't be surprised, the file is a lot larger than other Essentials games. There are lots of files in there, most of them sprites. The game folder is a little over 1gb when extracted so don't be surprised if It takes a while to extract everything. If you see any bugs in the demo (even small ones) or if you have any comments, suggestions about things you'd like to change, or if you just want to share your team, don't hesitate to post it in this thread! How do I continue playing on my save file from the previous demo? What is the difference between the two versions? The two versions are the exact same game, except that in Blue version, the trainers use inverse fusions. For example if a trainer has a Pikasaur in Red, the same trainer will have a Bulbachu in Blue. 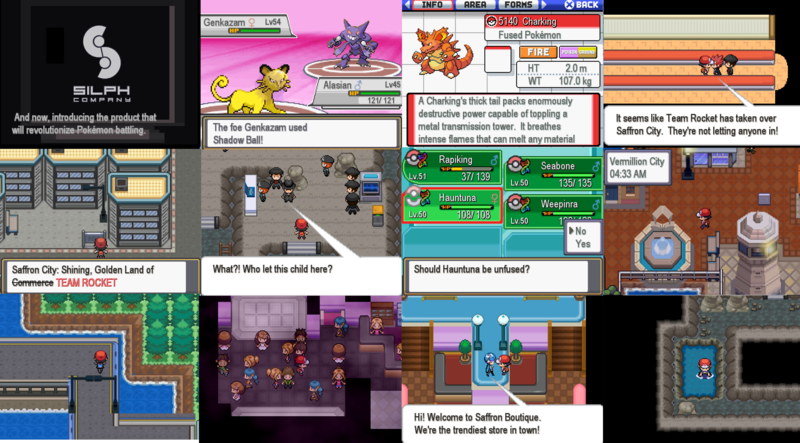 A few npc trades are also different between the versions, but all Pokémon are available in both versions. How does evolution work in the game? Each halves of a fused Pokemon evolve separately. As a note, trade evolutions now evolve at level 40. How about the stats? How are they calculated? As of version 3.0, stats are determined by a weighted average of individual stats. So for example, let's take a fusion between Gyarados and Caterpie . How are the types determined? If the two types are the same, then it will be single-type. There are some exceptions. Normal/Flying types are considered single-type Flying, Gyarados is considered single-type water and the Ghastly line are considered single-type ghost. How can I know which Pokemon will be the body and which one will be the head when fusing two Pokemon? Whichever Pokemon is the highest level will be the body. The other will be the head and color. A fused Pokemon gets the full movesets of both parents. So Blastizard will learn Hydro Pump at level 60 and then Inferno at level 62. Which ability does a fused Pokemon get? Fused Pokemon can get any of the four abilities from the two base Pokemon, at random. I don't like the way my fusion turned out. Can I undo it? You can use DNA Splicers on a fused Pokemon to unfuse it. However, you will not be able to unfuse a Pokemon that's been obtained in a trade without the upgraded DNA splicers. I got stuck, how can I get unstuck? You can use the DEBUGGER item to get teleported back to the last Pokemon center you’ve visited. However, use this item ONLY when absolutely necessary or it could lead to unusual behavior. If you’ve updated the game from a previous version and don’t have the item, make sure to talk to the Update Man at the top of any Pokemon Center. The sprites are ugly! Can't you just remake them by hand? Even if I was a good spriter (which I'm not), there are over 20k possible combinations in the game so it's simply unrealistic to do everything by hand. HOWEVER, you can replace the sprites yourself. Just add your Pokemon's new sprite in the Graphics/CustomSprites folder (make sure the new image is of the right dimensions and has the right name). Pokemon that normally evolve by trading in the official games have been changed so that they now evolve at level 40. Those are the only Pokemon whose evolution method was changed. The rest is all like in the official games. Where can I find a list of which Pokemon can be found where? 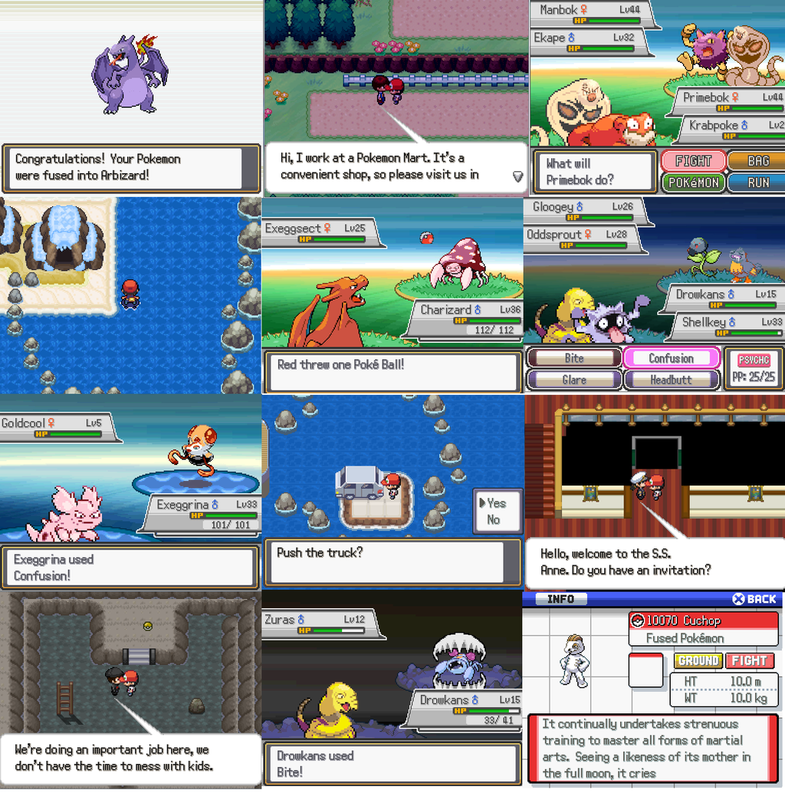 As a general rule, the encounter locations are the same as the official gen 1 games and their remakes, with altered encounter rates to account for the fact that all Pokemon are available in one version. It might not be 100% up to date, but it should give a good idea of the Pokemon distribution. Tell me if you notice it's really wrong and I'll update it with the most recent file. The game is not made with nuzlocke in mind. It is harder than your typical Pokémon game. A nuzlocke of this game is possible, but it will be very difficult. Version 3.0 ends after you get the 8th badge in Viridian City. 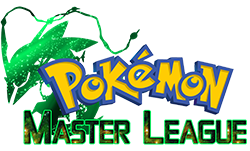 The Pokémon league will be added in an update shortly after. Depending on how fast you go, it should probably take you anywhere from 15 to 30 hours to finish it. Can I get multiple save files? Multiple save files are not officially supported. However, you can locate your save file folder in C:\Users\YourName\Saved Games\Pokémon Infinite Fusion. Rename the folder to something else and start a new game. You will then be able to go back to your old save file by renaming the folder to “Pokémon Infinite Fusion” again. Will I be able to reuse my save file in later releases of the game? Normally you should be able to, but I can't promise anything. As long as you make sure to be in a map that hasn't changed, there shouldn't be any problems. Keep in mind that some older areas will have changed a lot too though, so it might be nice to start a new game as well! Why is the download taking so long? There are over 90 000 sprites in total including shinies and backsprites (which aren't actually backsprites, but still have to be separate sprites). I'm trying to come up with a way to reduce the amount of images in the future (putting every sprites in one picture and have the game read their position in that file or something along those lines probably), but this is still a very early work in progress at this point. I can't find Flash to get through Rock Tunnel, where is it? The scientist on the top floor of hotels will give it to you after you've completed 4 quests. Will you ever add Pokemon from other generations? The owner of the new fusion website: http://pokefusion.japeal.com/ has given me the permission to use these sprites in the game. They will be added at some point in an upcoming update. All 22 650 Pokemon fusions, all with regular/shiny front sprites, movesets, stats, evolution levels, etc. The game is closer to a romhack in spirit than to your typical Essentials game in a way.There isn't a huge focus on plot with this game . Expect your general Pokemon experience of having a rival, gathering gym badges, challenging the elite four, etc. The usual restrictions on progression (you must have this gym badge to continue, etc.) will apply to keep a sense of progression and keep the player to go in areas with overleveled Pokemon and trainers. The basic plot has been mapped out but I'm always open to suggestions. I also so want to expend the Mewtwo/Cinnabar arc so it'd be nice to hear ideas on that as well. Aside from the regular Kanto areas, I also plan on having completely new explorable areas (because let's face it, everyone knows Kanto and there isn't much left to discover about it). It's all about having many areas with different combinations of Pokemon (and so a wider variety of wild PokeFusions). Cinnabar volcano Cinnabar will have an actual volcano that you can explore. Inside you'll find a bunch of fire and rock Pokemon such as Magmar, Rhydon, etc. 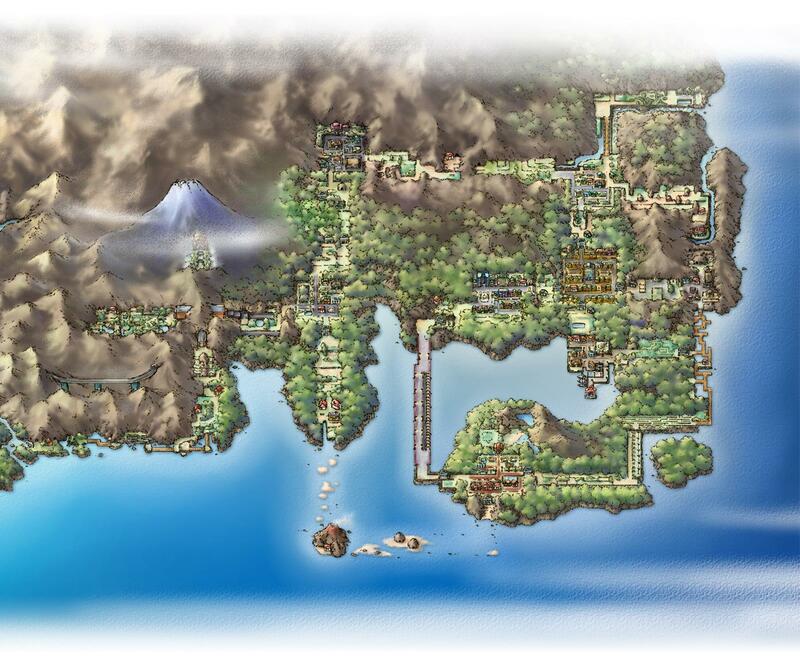 Cinnabar's gym is located within the volcano. This dungeon is also the new location of Moltres. Celadon SewersA completely new dungeon that sprawls under Celadon City with wild Grimers and such. Viridian River A river route that extends east of Viridian City. At the end of it you'll find some ruins of an ancient civilization. Pewter Valley A mountainous route South of Route 3 where you can find many strong Pokémon. Underwater: Dive will be a HM in the game so you'll be able to explore the depths of Kanto's water for the first time! They will mostly be located around Cinnabar Island and the surrounding areas. Some will provide access to otherwise unaccessible islands. You'll find a variety of Pokemon you'd normally only find by fishing such as Shellder, Krabby, etc. Mt. Silver Not really new I guess, but it's going to be there! 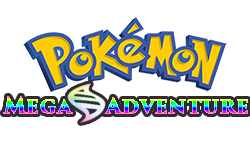 There won't be any Johto Pokemon though, unless I decide to add Pokemon from other generations (which would be cool but a LOT of work). And obviously you won't be able to fight Red on top because... well you're playing as him! There might be another surprise there though... You'll have to find out for yourself! Keep in mind, those are only ideas at this stage and they're all subject to change. I definitely want to add more completely new areas to make the world even more diverse and open, but while staying true to the map. I'm considering the forest area between Saffron and Viridian, the island east of route 14, the water route between Vermilion and the cycling road, or the mountains north of Pewter. But none of these are set in stone and I'm all for ideas of areas you'd like to see so suggest away! tiles to be used in this pack. Playtesting for 3.0 was done by the following Discord users (unless specified), in alphabetic order. If you helped testing and you don't see your name in the list, please contact me! Playtesting for 2.0 was done by the following Reddit users (unless specified), in no particular order. So cool to see this game nearly come to and end! 8 gyms man, that's a lot! Very excited to get around to playing this, good job man. It's also very cool that you are accepting custom sprites so some of the spliced mons look cleaner. I've always loved the idea of a game that's just Pokémon fusions and I'm really glad to see a project like this come as far as it has. Really hoping you can find more people to help you out with the custom sprites since there's a whole lot more that can be done with fusions than simple face swaps and palette swaps. I don't think I've seen a project with Gen 5 assets come this far before either so props to you for making as much progress as you have. Also, as a side note, I have an arrangement of Pallet Town's theme I never used before so if you'd like to see about using it feel free to send me a DM. :o oh wow, it's been a while since I last played Infinite Fusion, the first Demo I guess. Only Elite Four left now, I'll wait for the final release then~ Great work! I'm really glad to see that this is still being worked on, and so close to completion. Thanks for all the hard work you are putting into it. Version 3.0 is now available! Scroll down to download it! This game is all about having as many possibilities as possible and giving the player the choice to experiment with them. No two playthroughs will ever be the same due to the sheer amount of possible team combinations. The game is being developed with Pokemon Essentials on RPG Maker XP. This was originally going to be a rom hack of Fire Red. But memory issues proved this to be much harder than anticipated, so RPG Maker with Pokemon Essentials was chosen instead. Because of this, the storyline sticks to the original Gen 1 games. Do not expect a completely original storyline and npc dialogs even though the region was completely remade in 5th gen graphics. It's more of a remake in spirit. The region is more or less the same except for one big difference. You guessed it, there are fused Pokemon. You can encounter fused Pokemon in the wild, just like you can encounter regular Pokemon. In every area, you can find the Pokemon you'd normally find them, plus every possible fusions between the Pokemon that live in this area. So for example, on Route 1 you can find Pidgey and Rattata, which you can normally find there, but you can also find Ratgey and Pidtata. Legendary Pokemon will not be fused in the wild, but you'll still be able to manually fuse them with any other Pokemon. You only get one of each though so fusing your precious Mewtwo with a Caterpie might not be the wisest choice. You're still allowed to do it if you so choose though! The DNA Splicers from B2/W2 makes a comeback, but as a regular item this time. They can be used to fuse any two normal Pokemon together. They're only good for one use, but you can find more in every PokeMart. Trainers will use Pokemon fusions. They will mostly use fusions of Pokemon that aren't found in the same area. That way, they will be different from the ones you see in the wild. Wild fused-Pokemon, while already very diverse, are only a small fraction of the massive Pokedex. This will give the player the opportunity to think "Oh that combination looks cool, I should try it" and give him an incentive to experiment with manually fusing Pokemon instead of just using the ones you find in the wild. Some trainers will also offer you to trade any of your Pokemon for one of their's after you fight them or give you items. Here's a trailer for demo 2.0! This is a preview of the Trainer House. It's a Battle facility in which you face teams of random Pokémon! Again, I'm absolutely open to ideas on features, how certain mechanics should be done, etc. Feedback is always much appreciated of course. Hey for some stupid reason, some 4th and 5th gen abilties, like magic guard are not availible after fusion, could you look into that? Would be greatful and love your guys work! Is this game completed or still being worked on, and also how many generations of Pokemon are in this game?